Driving is a core aspect in the Grand Theft Auto series, encompasses nearly all activities in the games. The act of controlling aircraft as well as sea vessels falls under this article. Vehicle control has virtually remained unchanged throughout the series. Entry into a vehicle, be it by carjacking or otherwise, requires only a stroke of a key or button. 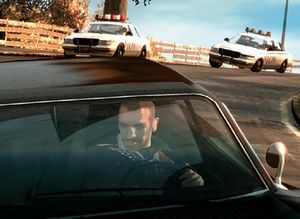 Road vehicles since Grand Theft Auto 1 (and, similarly, ships) allow the player to accelerate, brake, steer and engage the handbrake or emergency brake (E-brake). When a vehicle is stationary, the brake command can be used to reverse a vehicle, while the E-brake can be used to execute sharp turns or while parked on an incline to prevent rolls down the slope. Road vehicles are commonly available with a working horn and a radio or, for emergency vehicles, emergency radio chatter. The controls of aircraft are significantly different. Helicopters require the player control the speed of the rotor using the acceleration and brake commands, while banking requires the used of both the steering commands for side banks and two pairs of directional commands for forward/backward leans and turning. Similarly, fixed-wing aircraft utilize acceleration and brake commands to control forward thrust (affecting lift), steering commands for ailerons control, and two pairs of directional commands for elevator and rudder controls. The ability to control a vehicle is adversely affected by the type of vehicle the player is in. Motorcycles in GTA 1, for example, are capable of climbing up staircases when conventional cars can't. On the other end of the spectrum, larger, heavier vehicles, such as buses and trucks, are less maneuverable and often times lack in speed, making them poor candidates for evasion from the police although their durability and weight can also be taken into consideration. Heavy vehicles can also be used for fun as a battering ram against other smaller vehicles. Certain vehicles may also come equipped with special features, such as a weapon (e.g Tank, Rhino and Hunter), a water cannon (Fire Truck) or towing apparatus (Truck Cab or Tow Truck), which may be used to the player's advantage. Damage resistance should also been considered. A weaker body may offset the high performance of certain vehicles, while a slow, heavy vehicle may be far more resilient to damage. If a player is not proficient enough in their driving or has not properly planned their path to their destination, the choice of vehicle may become a hindrance if the player is urgently completing a mission or escaping from pursuers. Top-down view, which is purely used in GTA 1 (London packs included), GTA 2 and GTA Advance. The camera view is also available in GTA III, as well as GTA Chinatown Wars, which employs a top-down and forward viewing hybrid. 3D view, standard in GTA III, GTA Vice City, GTA San Andreas, GTA Liberty City Stories, GTA Vice City Stories and GTA IV, which usually employs a forward viewing angle or a cinematic view that takes advantage of an enhanced 3D environment.Originally, GTA III features four camera angles, in addition to the aforementioned top-down view, including two tail cams (further and closer to the player's vehicle), a bumper cam and, a cinematic cam. From GTA Vice City onwards, a third tail cam positioned even further from the player's vehicle is added. Carjacking, breaking into a vehicle or stealing an occupied vehicle. Drive-by shooting, the ability to fire a weapon from a vehicle. Voluntary and involuntary ejections, the ability to jump out of/off or be thrown out of/off a vehicle. Towing, the ability to haul trailers or other vehicles. Garages, storage area for vehicles. Spray shops, establishments allowing players to eliminate wanted levels while in a road vehicle. Modification garages for road vehicles. Crusher, a device used to crush vehicles for rewards. Prostitutes, NPCs, which can be picked up while on a car and "used" for player health. This page was last modified on 23 December 2011, at 16:46.